If you’re familiar with the twice-baked potato, then you’re already one step ahead on this dish. 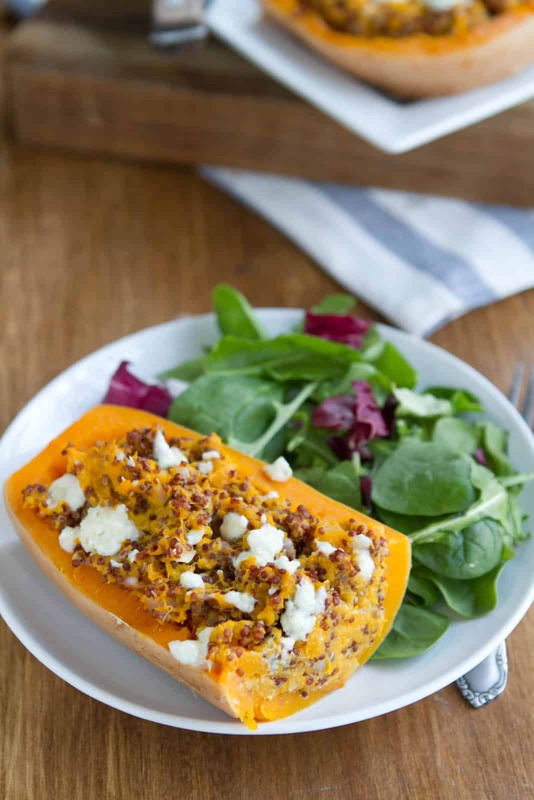 It’s a riff using a whole butternut squash that is steam roasted, stuffed with quinoa and cheese, then baked again. It’s a beautiful main dish that can easily be completed with a side salad or roasted vegetables. If you’re looking to save time when cooking, try roasting and stuffing the squash a day ahead of time or even a week or two and freezing until ready to eat. Preheat oven to 400˚ F. Slice butternut squash in half and scoop out seeds. Place each half cut side down in a 9×13 pan and pour 1/2″ of water in the bottom. Place in oven and bake until tender, about 30 to 45 minutes. Once done, remove and set aside. Rinse quinoa and set aside. In a medium pan heat olive oil over medium low heat. Dice shallots, add to oil, and saute until shallots are fragrant. Stir in quinoa and water. Bring to a boil, reduce to a simmer, and let cook until water is absorbed, 12-15 minutes. While quinoa cooks, scoop out butternut squash leaving a 1/4″ to 1/2″ on the sides and bottom. Drain water from pan and return butternut squash to the pan, cut side up. Mash butternut squash and stir in gorgonzola cheese. 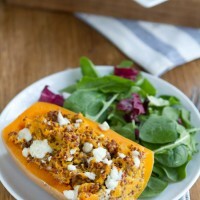 Once quinoa is done, add it to the butternut squash along with the salt, pepper, and any herbs you might like to use. Scoop filling evenly into butternut squash halves. Sprinkle with extra gorgonzola cheese and return to oven. Let bake for 10-15 minutes or until cheese has melted and the tops begin to brown. Remove from oven, cut eat half in half, and serve. 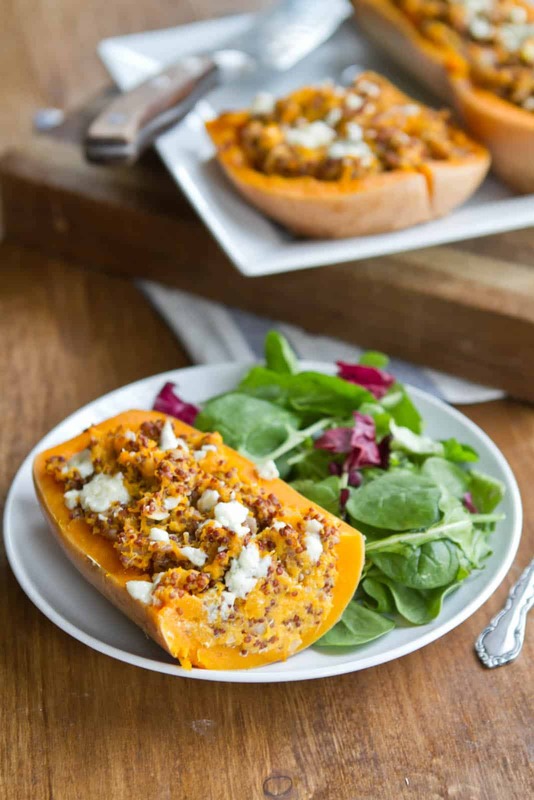 My favorite thing about this twice baked butternut squash is how easy it is to change of the filling based on what you may like or happen to have on hand. I chose quinoa and gorgonzola because that was the kick I happened to be on when making this recipe but since then, I’ve made countless variations. Grains: Quinoa is a great choice if you don’t have any grains precooked but if you’re like me and prep grains ahead of time, anything will go. I like farro or sorghum if I’m looking for a slightly chewier texture. Or, a great one to one swap for quinoa is quick cooking millet. Cheese: Choose a flavorful cheese like goat cheese, smoked gouda, or something similar to gorgonzola. Beans: Occasionally I’ll do something similar to this twice baked sweet potato where I’ll add a bit of curry powder and chickpeas into the filling. It’s a great boost of flavor and filling. You are a brilliant woman. Yum! This looks SO good! So healthy. Erin, this recipe looks amazing! Can’t wait to try it out. I really use to dislike Gorgonzola (or any tangy cheese) but now I can’t seem to get enough! You and I have the same exact taste in food! I just made your sweet potato farro risotto and was blown away… this is next on my list =). I’m glad you liked the risotto- I still think that’s one of my favorites! I love the color of this dish ! You’re blog is beautiful, thank you for sharing ! This dish doesn’t need many more words, it speaks for itself! Sounds delicious. I’ve made home made pasta before with butternut squash, shallots, and gorgonzola. The flavors are great together so I imagine this dish is delicious as well! I’m sure I’ll be using this combo a lot more! This looks sooooo good! Definitely going on my meals planned for next week! I made this for dinner tonight and it was delicious! Even my meat-and-potatoes only father tried it and loved it! Thank you! Ohhh, yum! And healthy, too. I bet the combo of butternut squash and gorgonzola is great together. Do you have any ideas for a cheese replacement? Trying to stay away from dairy. Thanks! OMG. Came across your website via punchfork. This recipe is AMAZING! We call it butternut pumpkin here down is Oz : ) This is the first time I’ve used quinoa and I’m hooked. Added rocket to the mix and turned out wonderful. Thank you SO much for this absolutely delicious recipe. I recently made these and they were awesome! The only adjustment I made was to add chopped apples into the mix. Delicious. Yum! I bet the apples added a bit of sweetness! Came across your recipe on Pinterest and made it for dinner tonight. My husband and I thought it was delicious!!! Thanks! Great! I also crisped some sage leaves in butter and mixed in, I really think it added some more flavor:). A keeper. Seriously so so good!! I absolutely loved this. I added toasted walnuts to give it a bit of crunch, but I think next time I may do pine nuts instead. This is fantastic! Some farms in the north of my prefecture have been shipping butternut squash to the city this summer, and I even went to the gourmet grocery to get Gorgonzola and quinoa! (Japan does not like stinky cheese, sadly.) Incredibly easy to make and delicious! Do you eat this with the skin on? I’ve always peeled my butternut squash, so I wasn’t sure? Nope, you just scoop out the insides to eat- the skin just serves as a bowl! Just tried this tonight… Love!! Flavour was amazing. Had to substitute the Gorgonzola for feta because a dinner guest isn’t fussy on blue cheese, but it was a big hit! May I ask…why the water when roasting the squash? I thInk I already asked, but the post disappeared from here…why the water when roasting the squash? Many thanks…recipe being cooked as I type. Hi Susan, your comments are both here (I only check the site once or twice day so I don’t always respond right away). I use the water to keep the flesh moist and non-burning. Made this tonight – absolutely delicious. I substituted a lovely local goat cheese since I am not a fan of gorgonzola and it turned out perfectly. Thanks! Yes! I love goat cheese in this dish too! I am a team Beachbody coach and just found your blog through Pinterest! What A BEAUTIFUL website you have!! THANK YOU for all the great recipes and the beautiful photography!! do you think this would work with acorn squash? I think it might- you might need to adjust the baking times (possibly lower). I love this dish, have made it a few times now!! I brought the recipe to a bridal shower yesterday (everyone brings their favorite for the bride). I’m not usually a fan of gorgonzola since it’s quite strong, but it is balanced perfectly with the other ingredients. I also add fresh sage to mine, so good! This is quite possibly the most delicious dish I’ve ever made. It’s my go-to for date nights and dinners, and recently I made a few changes and I’ve been bringing it to potlucks and holidays as a veg friendly side!! Brilliant work! This is a great recipe. The flavor combination is awesome and my family loved it. I did do a few minor modifications. I mixed cooked quinoa with the sautéed shallot instead of cooking the quinoa with the shallot. I also just cubed the whole squash and roasted it. Then I mixed the cheese with the squashed and layered it over the quinoa to warm in the oven. As a side note, I was really happy to find this website. I’ve tried several other recipes and have not been disappointed. Thank you! This has been a favorite of ours. I’m planning to take it to Thanksgiving . Do you think I could make it the day before in a casserole dish and reheat it there? Leave uncovered- helps the cheese brown up a bit! This dish was amazing! I drizzled a little bit of pure maple syrup on the top before the second roast and it added a sweetness that paired nicely with the tang of the gorgonzola. I was also thinking of sprinkling brown sugar on the next time too. SO SO good!